When the Red, Red Robin. . .
As the lemon snapped off, the robin flew from the slightly bouncing bough bowing heavy with lemons. (How's that for purple prose?) The red-breasted bird landed on the fence and scolded me. "Excuse me," I said, and continued gathering lemons for lemonade. Several days later, Molly the Cat and I were wandering near the lemon tree. Two robins swooped by and landed on the neighbor's roof. The bigger bird stared at me, as if saying, "Out! Now! Please." I understood immediately. "Come on Molly, let's go inside. These guys have a nest in the lemon tree." As you can tell from the photos, the robins hid their nest quite nicely. 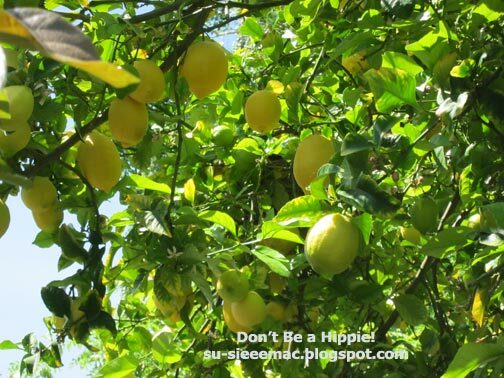 At first, I thought it was precariously situated on the limb, but, hey, if nobody picks the lemons, it's safe. 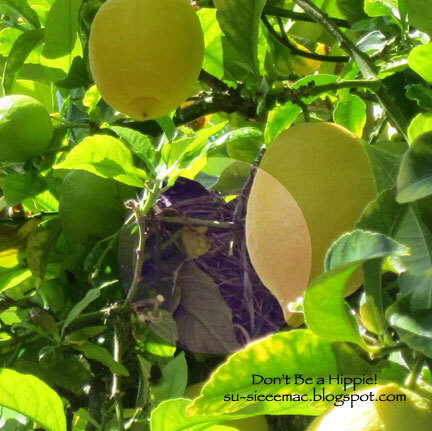 And, that is what has happened, which is too bad since there are some nice-looking lemons on that branch. The mama and papa robins have been taking turns sitting on their babies. I wonder if they like the scent of the lemon blossoms that surround them. 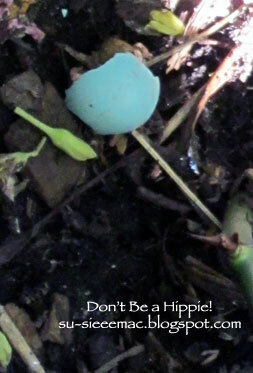 This morning, Molly the Cat found part of a robin eggshell on the ground. I showed it to the Mama who promptly stuck it in one of her rose pots. Just a matter of time before we can start seeing lemon robin babies trying out their wings.